MIDAS stands for Marine Information and Data Acquisition System. This suite of programs is developed at Flanders Marine Institute (VLIZ) to plan the cruises of the RV Simon Stevin, to register the research activities during these cruises and to capture navigational, metereological and oceanographic parameters while underway. All data is organized in cruises and trips. Either use the schedule, the chronological list of cruises or the cruises ordered by campaigns to select a specific cruise and trip. For each performed trip a link to the underway data, the stations, research activities and a map of the track is available. For questions on scientific operations or schedule contact Andre Cattrijsse (Tel: +32 (0)59/342139). To request ship time please use this form. For technical issues, comments on MIDAS or data requests contact Francisco Hernandez (Tel: +32 (0)59/342136). The RV Simon Stevin performs coastal oceanographic research in the Southern Bight of the North Sea and in the Eastern part of the English Channel. It also serves as a training platform for students from marine scientific and maritime study programmes and as a test platform for new marine and maritime technologies. In addition, educational trips for schools are organized aboard the vessel. The RV Simon Stevin has a wide range of coastal oceanographic research capabilities: physical oceanography, fisheries research, marine biology, microbiology, chemical oceanography, geochemistry, technology, maritime archeology, marine pollution, earth sciences, etc. VLOOT dab is the shipowner and VLIZ is responsible for the scientific programme and the management of the research equipment. 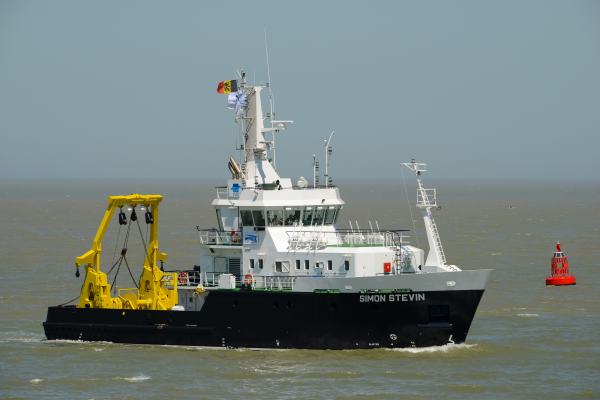 More about the RV Simon Stevin its operations, specifications and available research equipment here. The ‘Zeekat’ is a Rigid Inflatable Boat (RIB) that can be used from the research vessel ‘Simon Stevin’ as well as from land. It is used in the Belgian part of the North Sea and the adjacent French, Dutch and English coastal waters (48°N - 56°N). The ‘Zeekat’ can also be used in the Scheldt estuary. The reinforced keel is intended to allow the vessel to run ashore on tidal banks. VLIZ has the necessary means to bring the boat to wherever it is needed. The ‘Zeekat’ can carry up to 6 persons on board, including a captain - provided by the VLIZ. Modular cases and instruments can be fixed by means of the rails in the deck. A generator is available to feed a portable computer or other main voltage appliances. Technical information about the RIB Zeekat here. The RV Zeeleeuw was in service from 2001 to 2012 and is now replaced by the RV Simon Stevin. During those 10 years the RV Zeeleeuw sailed about 80.000 miles, over 1000 scientists came aboard to perform research, more than 4000 students and pupils participated in educational trips and around 5000 persons visited the research vessel during public events. The RV Zeeleeuw was a former pilot vessel, constructed in 1977, that had been rebuilt in 2000 to a research vessel. After more than 10 years of service, there was a need for a modern, well equipped vessel, with a restricted draught needed for an optimal accessibility to shallow coastal waters of the Southern Bight of the North Sea and the surrounding estuaries. These features are now offered by the RV Simon Stevin.